Robin Yang is seen here in this undated file photo. How to navigate adult life like a boss, from turning your job into a career, investing your hard-earned money, building relationships and more. Because adulting is not easy. Robin Yang was fired from her dream job after just two months. Before this happened, she remembers ignoring red flags about the culture there and fitting in with the company, "Because I couldn't believe I got to work there." In fact, she was even told someone called her "uppity," which caused her to question herself. "I took it to heart, 'What did I say? What did I do?'" she told "Good Morning America." "I was gone a few weeks later ... that happened over eight years ago." That experience held her back for years and made her fearful about speaking out, asking questions and possibly rubbing someone the wrong way at work, she said. Now Yang, who works in the video game development space, understands that position was never really a dream job at all. "If I show up genuinely as myself and was authentic and they didn't like it, that wasn't a dream job," she said. While attending a series of webinars a couple years back, Yang met Ashley Pare, founder and CEO of Own Your Worth, LLC, an empowerment organization helping young professionals to take charge of their career and look at work, especially salary, from a different perspective. Pare caught Yang's attention after leading a webinar called "Giving and Asking for Feedback," which was aimed at helping women speak with their co-workers and managers, getting feedback so they can self improve, highlighting areas maybe they may not be aware of and even getting validation from co-workers that can be key to use down the road for salary negotiations. Yang worked with Pare for the next three months, which changed everything, including how she looked at opportunities she's gotten in her life from being "given" them to having "earned" them, among other self-limiting traits. "It's always really hard to push forward and think I did earn these things," Yang said. "But it's such a positive mindset change." Pare also inspired Yang to advocate for herself and how to approach that always awkward "I believe I've earned a raise" conversation. "We often think about in a meritocracy," Yang said. "My work should speak for itself." But that's just not the reality, she added. "You selling and presenting your work with confidence makes your manager's job easier and it makes them more likely to see" that you deserve the promotion you know you really want, Yang said. Well after shedding these self-limiting restraints, Yang says she "earned" a five-figure raise last year, which was followed by a second. But it's not about the money for her. She's now helping others like herself by following in Pare's footsteps and giving speeches at conferences and seminars, including a talk on salary negotiations at the Game Developers' Conference in San Francisco in March. If you are feeling undervalued, underpaid or under-appreciated, here's some simple ways to approach your manager and maybe get that raise. If you ask specifically about salary, managers aren't going to be so amenable at first, Pare told "GMA." It's really how you word it. Then you can guide the conversation into more responsibility, less responsibility, more money, etc. 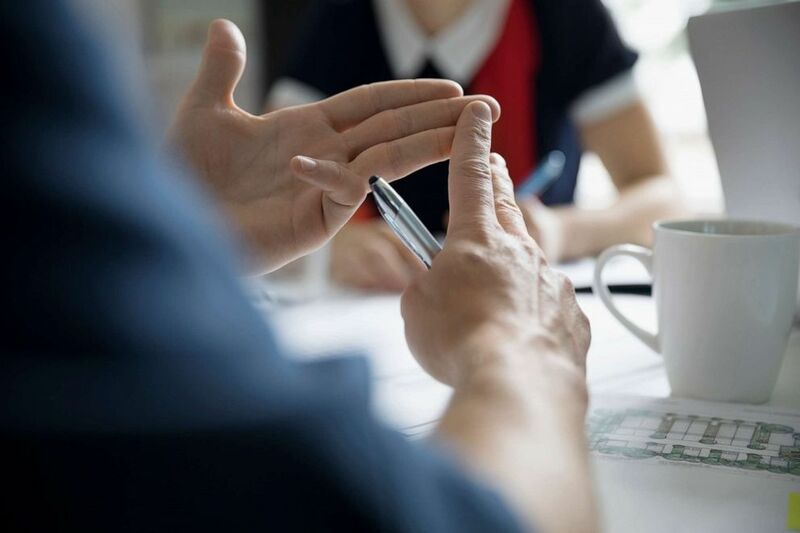 Stock photo of two people talking during a meeting. "It's really about carving out time specifically with your manager to give them a heads up, 'Hey, I'd to talk to you about my career development within the company,'" she added. This simple way of presenting your case helps set the stage as a "conversation versus a negotiation," she said. This is one of the most misunderstood truths, Pare told "GMA." First, you need to figure out what you want before you go to your manager and ask for it. You never just want to storm in with problems and issues you have with your job or just ask for more money. But asking for everything you want always feel better than not asking, even if you don't get it, Pare added. Hearing "No" is just part of life and you won't resent yourself if you at least asked for what you think you deserve. Tis the season for year end reviews and raises! •You may be thinking vacations, parties and gifts, but for HR and Managers year end means planning for next year. Conference rooms are filled all across the globe discussing budgets and headcount. •If you’ve been thinking about asking for a raise, now is the time to prepare. Seize this opportunity to set yourself up for success next year. Your career growth depends on it •If you are motivated to ask for more, join us. We’ll talk about the do’s and dont’s and the when’s and how’s of asking for a raise. Don’t let the year end review ‘raise trap’ happen to you! Now is the time to discuss your career development, your future, and your worth. •Budgets will open up soon, will your name be at the top of the list? Join me and @tech.ladies on Wednesday for this empowering webinar! Link in bio. Also, it's absolutely OK to say "No" yourself, especially when you have a job offer or promotion in front of you if you don't feel the compensation is enough. "That is the most leverage you will ever have with that company," Pare said. "People worry about losing the offer, but if you can flip that and say, 'This company really wants you and they've invested time and money in getting you,' then you realize they are willing in most cases to work with you to make [what you want] happen." So many emotions come into the equation when you try to self advocate or ask for more money. So, get yourself some data about why you should be paid more or promoted. "Before you speak to anyone from the company, do your research online," Pare said, suggesting sites like salary.com or payscale.com. "Do a search of what's competitive in the marketplace and talk to peers," she added. Also, be clear with yourself on what you want. Make a promise to yourself about what your must-haves are. The clearer you are, the more your manager will want to work with you. "When I do workshops, even in practice, it still feels uncomfortable" to ask for more money, Pare said. "Especially if you're raised to avoid confrontation or be nice. We are up against these self-limiting beliefs." For this reason, Pare suggest practicing in front of a mirror and even record yourself so you can hear and see what you sound like. "Fears have less power when you put your voice to it," she said. 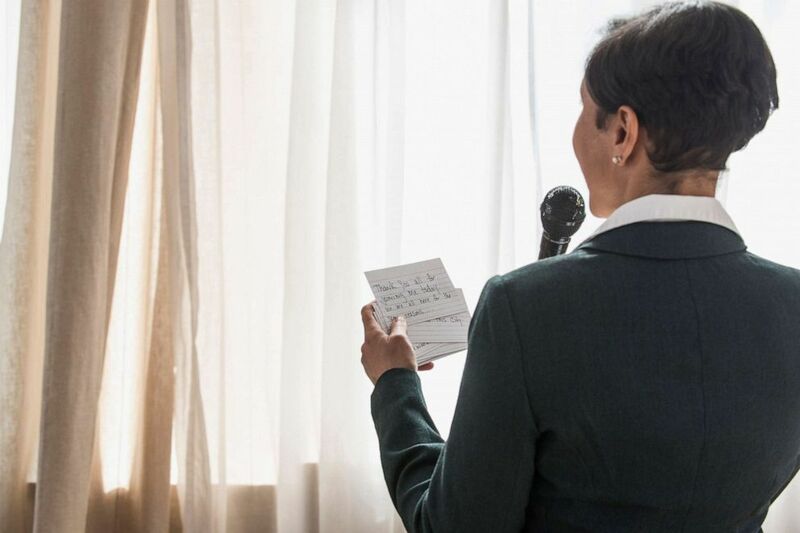 Stock photo of a woman practicing a speech. Also, practice helps take the emotion out of it. Look, this IS going to be emotional, it's your career and you feel like you deserve better. But if you take a step back and practice, it can stop your fear from holding you back. It also helps with nerves and allows you to say, "I've done everything I can to prepare." It shouldn't all be about you. See what they think and ask what you can do over the next three to six months to move towards a promotion. "You can say something like, 'I've put together a plan, but I'd love to get your input,'" Pare added. The most powerful line within this scope is asking, "What else do you need from me to advocate on my behalf?" This really makes your career growth more of a partnership than a one-sided ask. This can also turn a "No" into a "To be continued." "That line also gets the boss to really share whether they are on board to advocate for you," Pare said. "It's important that employees feel like their manager is on their side and they come up with the solution together." How will it affect the business? Put things into terms they will really understand. Maybe if you don't get a pay bump or the title you are looking for, you may have to prioritize other things and some tasks will get lost. "Coming back to why it's good for the business that the person gets a raise or a promotion," Pare said. If you are not paid fairly or competitively, it's going to affect your motivation and your ability to complete tasks or meet goals the business has set. That's bad for the bottom line. "I have a client, who is the typical situation," she said. "They want to give her the title, the responsibility, but no extra money. And she's like, 'No, I don't want to take on that responsibility.'" This might be the hardest self-limiting principle, but the one that will have the most results once it's lifted. "It's not about being greedy, money for me is about energy, our ability to give and receive," Pare said about getting a raise. "When we show up to work everyday, commit to an employer, invest our time and our experience with a company, we have that choice," she said. "That every day we are going there, we are giving it our best." So, when you think about salary or money, think of it as what would make you feel valued in the company. Pare doesn't see more money as greed, but something that through hard work affords you to spend more time with family, take more trips, basically experience and enjoy life more. If you look at it that way, the stigma of more money tends to wear off.